If there's anything American dudes like more than organized athletics, it's their dogs. Nothing says "emotionally complex" quite like a guy who leans into sports, but comes home each night to gently cradle his French bulldog to sleep. But imagine a world where dogs are athletically superior to humans -- where canines can out-sport frat boys before coming home to cradle their men to sleep. What would that say about constructed masculinity? Well, we don't have an answer to that one, but it seems we have seen a dog show up some serious human athletes. 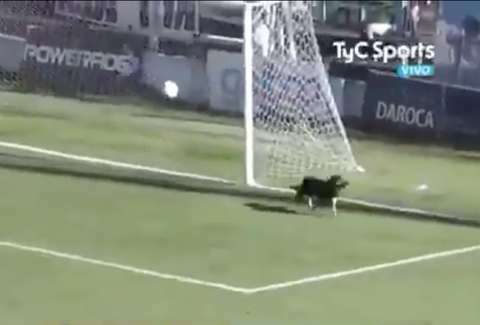 In a soccer match on Sunday between opposing Argentinian teams, Juventud Unida and Defensores de Belgrano, the standout MVP was not a player, but rather, a stray dog. As the game neared its end, the Defensores team was already down by three, when their goalie, having deflected a shot, went to punt the ball up the field. Apparently, his depth perception -- or perhaps just his general mastery of ball-handling -- fell short, and he kicked the ball directly into another players back, landing it about six inches from where he stood, rather than somewhere across the field. This should have been an easy in for Juventud, but as they set up the shot -- a clear, goalie-free target -- a rogue stray dog sprinted across the field, deflecting the ball as it sailed towards the goal. The ball rolled out of bounds, and the very good boy simply continued on his merry way across the field. It was, without a doubt, the most spectacular save of the season. In spite of this small, genuine miracle, Defensores still went on to lose -- they were, of course, three down. All in all, it was a bit of a ruff game (sorry). That said, perhaps in our global efforts towards inclusion, we should consider the absolute hypocrisy of barring dogs from our sports teams.